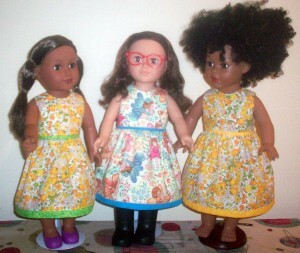 Blimmy, it’s been a while since I’ve uploaded a Share and Tell blog but I really wanted to get my blogs on resizing patterns out so you can all start experimenting, especially as these smaller dolls are so popular at the moment. So let’s get started, or should I say ‘sharing’. ‘Good Day Rosie, I have done the online course. I want to thank you for this program it’s been a life saver for me. I’m 66 years old and have little knowledge of sewing….. I am sending you 3 pictures of outfits I have done so far. I am getting better, but have a long way to go. Still the girls love them and don’t even mention the flaws. Thanks for your site and instruction. I think you’ve done a wonderful job Michael and you should be sooo proud of your creations, I’m not surprised that your girls love them! It’s awesome to receive emails from people who are enjoying my course and getting immersed into their new found love of sewing doll clothes. Sandy is enjoying making my summer dress at the moment and I have to say that my summer dress pattern is my most popular because it has so much potential for alterations! ‘Hello Rosie, I am truly enjoying your course how to sew doll clothes. I have learned so much, I love all the tricks and tips, I love all the patterns and hope to own them all. I love the videos that come with the patterns as it takes away so much stress from not understanding directions that have come with other patterns. Thank you for such great lessons. I am enjoying making the summer dress, and have more to make. I will also try all the how to alter doll clothes I found on your You Tube channel. I am enjoying this pattern so much. And I even have a few ideas of my own I will try. So look for more pictures. Thank you, you made sewing doll clothes so much fun. You can find links to my video series on Altering my Summer Dress pattern that Sandy mentions above, and many other helpful blog on my Free Resources Page. Nancy has made some gorgeous wedding dresses using my Wedding Dress pattern and has altered one to have a train. What more can I say, they are ABSOLUTELY BEAUTIFUL! 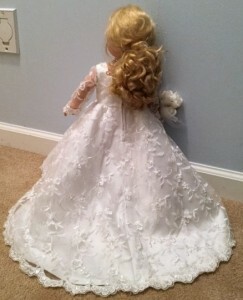 ‘Enclosed are pictures of the two wedding dresses I made using your pattern. Instructions and videos were great! As you can see on the second dress I lengthened the back to a train and I love it! The one with the train is everyone’s favorite! Thanks for a great pattern! Ahhhh, I get goosebumps when I hear how much pleasure grandmothers are getting out of making doll clothes for their granddaughters, and how much fun the granddaughters are having playing with these clothes. The memories that are being created are priceless and I am so blessed to be helping make this happen. The following two emails definitely made my heart sing. 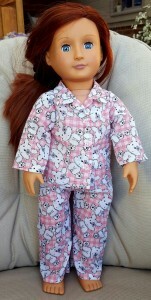 I would like to say I am very happy with your how to sew doll clothes video course. I haven’t watched all the video’s although I’ve gone through some others a few times. I have learned some new things in your little tricks of which I had a giggle to myself because I’ve been using some of those tools for many years but would not have thought of your idea’s (they are great). I can’t show you a model of the clothes because I was making for my youngest granddaughter and the pics I took I had deleted in case she got to see them before I gave them to her (sometimes the kids want to play a few games on my phone where the pics were) but I’ll take with my other camera next time. 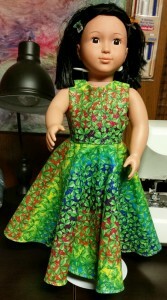 I’ve since ordered the dvd pack because my other granddaughter wants to make her own doll clothes, I am very excited about that because I’ve been sewing for some years and none of my daughters took on sewing. I’ve not made doll clothes before (never had the time) but I’m enjoying this, probably because one doesn’t have to be so precise. Now with children going back to school, and no little ones to mind this year while mum goes to work, I will have more time on my hands so am looking forward to making more doll clothes. But my first project will be making the pin holder to put under the sewing machine, I think that’s a fantastic idea. I am so happy I found your website. Annelie, that’s awesome news that your granddaughter is keen to learn how to sew her very own doll clothes, I’m sure you are going to create lots of wonderful memories with her. I can imagine how excited you are feeling about this because although my daughter has sewn a few items, she really hasn’t taken to sewing (she’s more into mountain bike riding) and I hope that maybe one day when I have grandchildren, one of them would like to learn. I look forward to receiving photos of your projects and hearing about your granddaughter’s sewing adventures. 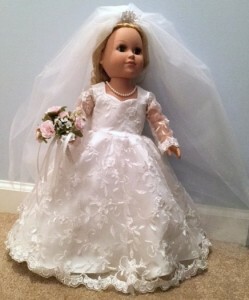 Thank you to everyone who has sent me in photos of your doll clothes creations and I do hope you will forgive me for taking so long to share them. Hi Rosie, It is lovely to see so many people, like myself, being inspired by your work. When I first found your site, it was because I was looking for a way to teach Kayla and build up her confidence. It worked a treat and even got her points towards her Prince of Edinburgh Award and then my ( now 19yrs old ) grandson Kyle got in on the act. He loves Cosplay and we are still working together. Now Lauren (10yrs ) is my sewing buddy. I even make things for my husband and myself, from time to time and it all took on a life of it’s own from watching your videos and many ‘Aha’ moments which showed me easier ways to do thing. The most used tip for me has been – Sewing as much as you can Flat. Works a treat on all sorts of things. Best wishes always.